In asexual reproduction, only one parent is involved. Get permanent slides of hydra,Observe them using hand lens or a microscope. Look out for any bulges from the parent body. Count the number of bulges that you see in different slides. Also, note the size of the bulges. Another method of asexual reproduction is observed in the microscopic organism, amoeba. Let us see how this happens. You have already learnt about the structure of Amoeba. You will recall that amoeba is a single-celled organisms. It begins the process of reproduction by the division of its nucleus into two nuclei. This is followed by division of its body into two, each part receiving a nucleus. 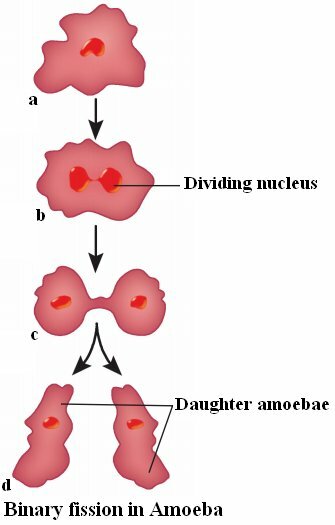 Finally, two amoebae are produced from one parent amoeba. This type of asexual reproduction in which an animal reproduces by dividing into two individuals is called binary fission. Apart from budding and binary fission, there are other methods by which a single parent reproduces the young ones. Cloning is creating an exact copy of a biological entity.A clone is created by inserting the complete genetic material of a regular body cell from a donor into a recipient.Sheep are viviparous animals, and so propagate their offspring sexually.Sir Ian Wilmut from Roslin Institute in Edinburgh, Scotland created Dolly. During the process of cloning Dolly, a cell was collected from the mammary gland of a female Finn Dorsett sheep. Simultaneously, an egg was obtained from a Scottish blackface ewe. The nucleus was removed from the egg. Then, the nucleus of the mammary gland cell from the Finn Dorsett sheep was inserted into the egg of the Scottish blackface ewe whose nucleus had been removed. The egg thus produced was implanted into the Scottish blackface ewe. Development of this egg followed normally and finally Dolly was born. Though Dolly was given birth by the Scottish blackface ewe, it was found to be absolutely identical to the Finn Dorsett sheep from which the nucleus was taken. Since the nucleus from the egg of the Scottish blackface ewe was removed, Dolly did not show any character of the Scottish blackface ewe. Dolly was a healthy clone of the Finn Dorsett sheep and produced several offspring of her own through normal sexual means. Unfortunately, Dolly died on 14th February 2003 due to a certain lung disease. Since Dolly, several attempts have been made to produce cloned mammals. However, many die before birth or die soon after birth. The cloned animals are many-a-time found to be born with severe abnormalities.Dolly suffered from arthritis.Cloning could impact mental development.Advocates of human therapeutic cloning believe that cloning could help in producing organs for transplantation and in regenerative medicine. The type of reproduction in which only a single parent is involved is called asexual reproduction. 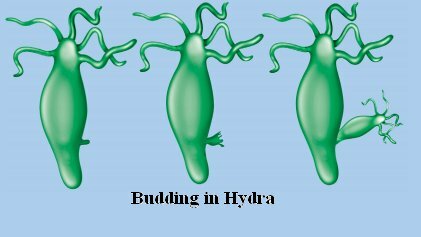 In hydra, new individuals develop from buds. This method of asexual reproduction is called budding. Amoeba reproduces by dividing itself into two. This type of asexual reproduction is called binary fission.